The Frankfurt African Studies Bulletin (FAB) are published annually. 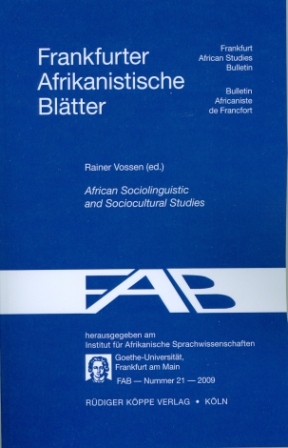 They are edited by members of the Institut für Afrikanistik of the Goethe-University in Frankfurt/Main, Germany. Volumes 1 to 4 as well as 6 and 7 of FAB are still available. We distribute these volumes in commission. Please order via email or through you local bookseller. Edited by: Rose-Juliet Anyanwu. With an introduction by: Rose-Juliet Anyanwu. With contributions by: Rose-Juliet Anyanwu, Denis Creissels, Gerrit J. Dimmendaal, Djibril Dramé, Anne-Maria Fehn [show more…], Raimund Kastenholz, Lutz Marten, Maarten Mous, Tatiana Nikitina, Gertrud Schneider-Blum, John R. Watters, Georg Ziegelmeyer. Edited by: Joseph C.A. Agbakoba. With contributions by: Joseph N. Agbo, Jeremiah Chidozie Chukwuokolo, Edward Uzoma Ezedike, Amos Ameh Ichaba, Philip Adak Idachaba [show more…], Adejoh Sylvester Ogba, Rainer Voßen. Edited by: Klaus Beyer, Raija Kramer. With an introduction by: Klaus Beyer, Raija Kramer. With contributions by: Klaus Beyer, Bruce Connell, Raija Kramer, Holger W. Markgraf, Nico Nassenstein [show more…], Henning Schreiber, Georg Ziegelmeyer. Edited by: Bernhard Köhler. With a preface by: Bernhard Köhler. With contributions by: Torben Andersen, Baye Yimam, Abdourahmane Diallo, Mary Esther Kropp Dakubu †, Rudolf Leger [show more…], Rose Letsholo, Stéphane Robert, Russell G. Schuh †. Edited by: Rainer Voßen. With contributions by: Joseph C.A. Agbakoba, Vincent Erskine Aziaku, Carl Ebobissé, Henrike Firsching, Eva Rothmaler [show more…], Julia Maximiliane Schwarz, Naïma Tahiri. Edited by: Rose Marie Beck. With an introduction by: Rose Marie Beck. With contributions by: Joseph Baya, Thomas Bearth, Bernadette Böcker, Clarissa Eck, Nadine Sieveking [show more…], Lydie Vé Kouadio, Vic Webb. Edited by: Sascha Völlmin, Azeb Amha, Christian J. Rapold, Silvia Zaugg-Coretti. With contributions by: Azeb Amha, Giorgio Banti, Isabelle Bril, Christian J. Rapold, Chris H. Reintges [show more…], Aone van Engelenhoven, Sascha Völlmin, Andreas Wetter, Silvia Zaugg-Coretti. Edited by: Sonja Ermisch. With contributions by: Rose-Juliet Anyanwu, G. Tucker Childs, Sonja Ermisch, Christa Kilian-Hatz, Christa König [show more…], Marina Stoyanova, Jochen Zeller, Petr Zima. Edited by: Rose-Juliet Anyanwu. With a preface by: Rose-Juliet Anyanwu. With contributions by: Khalil Alio, Rose-Juliet Anyanwu, Abdourahmane Diallo, Herrmann Jungraithmayr, Bernhard Köhler [show more…], Antje Meißner, David Roberts, Eno-Abasi E. Urua. Edited by: Dymitr Ibriszimow, Eva Rothmaler. With contributions by: Heinrich Bergstresser, Mártha Galántha, Ludwig Gerhardt, Dymitr Ibriszimow, Doris Löhr [show more…], Eldridge Mohammadou †, Christopher Y. Mtaku, Eva Rothmaler, Gisela Seidensticker-Brikay †, James H. Wade, Ibrahim Maina Waziri. Edited by: Rose-Juliet Anyanwu. With contributions by: Rose-Juliet Anyanwu, Lee S. Bickmore, Denis Creissels, Laura J. Downing, Zygmunt Frajzyngier [show more…], Leoma Gilley, Larry Hyman, Roland Kießling, Wilhelm J.G. Möhlig, Robert Nicolaï, Imelda Udoh, Rainer Voßen. Edited by: Rudolf Leger, Anne Storch. With contributions by: Rose-Juliet Anyanwu, Thomas Geider †, Herrmann Jungraithmayr, Roland Kießling, Reinhard Klein-Arendt [show more…], Rudolf Leger, Anne Storch, Rainer Voßen. Edited by: Dymitr Ibriszimow, Rainer Voßen. With contributions by: Mohamed Aghali-Zakara, Alain Bentolila, Yahya E-Rramdani, Abderrahman El Aissati, Lionel Galand † [show more…], Paulette Galand-Pernet †, Maarten Kossmann, Mena Lafkioui, Naïma Louali †, Kamal Naït-Zerrad, Mohand Akli Salhi, Mohand Tilmatine. Edited by: Antje Meißner, Anne Storch. With a preface by: Antje Meißner, Anne Storch. With contributions by: Rose-Juliet Anyanwu, Sergio Baldi, Roger M. Blench, Michael J.C. Echeruo, Herrmann Jungraithmayr [show more…], Ulrich Kleinewillinghöfer, Yao Koffi, Jouni Filip Maho, Antje Meißner, Michael Noonan, Anne Storch, Gábor Takács, Ulrike Zoch. Edited by: Sabine Neumann. With a preface by: Sabine Neumann. With contributions by: Norbert Cyffer, Andreas Dafinger, Till Förster, Peter Gottschligg, Doris Löhr [show more…], Sabine Neumann, Mechthild Reh, Anne Storch, Thomas Widlok, Edwin N. Wilmsen. Edited by: Klaus Keuthmann, Andrea Reikat, Hans-Jürgen Sturm. With contributions by: Andreas Dafinger, Delia Haust, Ulrike Hug, Peter Müller-Haude, Sabine Neumann [show more…], Andrea Reikat, Hans-Jürgen Sturm, Rainer Voßen. Edited by: Rudolf Leger. With contributions by: Hamadou Adama, L.-G. Andersson, Michael Broß, Paul P. de Wolf, Abdourahmane Diallo [show more…], Ludwig Gerhardt, Peter Gottschligg, Tore Janson, Sani Jauro, Rudolf Leger, Abubakar B. Mohammad, Ahmad Tela Baba, Galina Zoubko. Edited by: Uwe Seibert. With a preface by: Uwe Seibert. With contributions by: Luc Bouquiaux, Raymond Boyd, Norbert Cyffer, Sabine Dinslage, Ulrich Kleinewillinghöfer [show more…], Gabriele Sommer, Anne Storch.